'Complete at last' proclaims the video cover, despite the fact that Episodes 1 and 4 are missing. Oh well, at least they've released it. 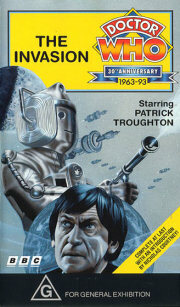 The Invasion confirms my belief that the Cybernen were at their best in the sixties. So what if they looked like men in suits? They only look like that because you know they are men in suits. Nicholas Courtney's gap-bridgers are rather good, although his Episode 1 synopsis left out some fairly important details which are necessary if you are to understand later minor developments. The picture and sound quality varies a lot - why? The back cover says it is 'due to the archive nature' of the episodes. What does that mean? It doesn't sufficiently explain why Episodes 2, 6 and 7 are pretty abysmal, Episodes 3 and 5 are okay, and Episode 8 is excellent. The Tomb of the Cybermen was in Hong Kong for over twenty years and nothing was wrong with it. Every story has its bad points and there are some real cringers in The Invasion. Some of these are: Packer shouting at his wrist-communicator; the Professor's cheap emotion-inducing machine; the missile launch sequences, which is obviously stolen from another source and have tinny sound effects dubbed over them; and the destruction of the Cyberfleet - how can a ship blow up when the missiles bounce off it?! These bad points are minor annoyances in a story with overwhelming excellent points. Watch out for the Cybermen emerging from their cocoons in the Electromatics warehouse; Tobias Vaughn laughing as he is shot by Professor Watkins, who faints when he sees the bullets have had no effect on Vaughn's cybernetic body; the climax to Episode 6 - a classic piece of Doctor Who; the battle in Episode 8 and Troughton's cartoon-ish running sequences. Hopefully sales of this tape will encourage the BBC to release tapes of other stories that are relatively intact. Perhaps The Ice Warriors could be next on the cards?